Julius Peppers, wearing No. 56 in honor of Lawrence Taylor, is changing things up for the Green Bay Packers. Thanks to the Green Bay Packers, he doesn’t have to. After 12 seasons as one of the top defensive lineman of his generation, Peppers is getting the chance to reinvent himself. He had toyed with shifting to outside linebacker in the past, but fate — and an admitted touch of self-doubt — kept him at defensive end. That was until Peppers took the plunge — his own version of the Lambeau Leap, of sorts — by signing with Green Bay. Packers general manager Ted Thompson believed Peppers, 34, could make the transition despite his age while also coming off a disappointing 2013 season in Chicago that led to his offseason release. 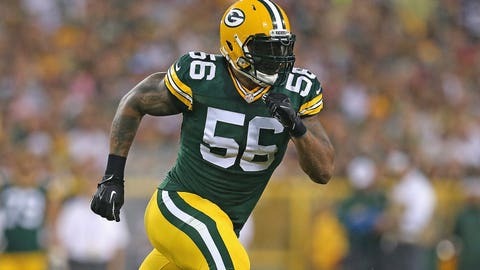 Ignoring chatter about Peppers’ decline, Thompson was so confident Peppers could rebound that he entered the free-agent marketplace – a loathed undertaking because of Green Bay’s homegrown roster philosophy – and signed him to a three-year, $26 million deal. That included what skeptics believed was a robust $8.5 million payday for the 2014 season. Based upon early returns, Peppers might actually end up being a bargain. A taste of the impact Peppers could make came last Friday in Green Bay’s preseason win over Oakland. He registered three solo tackles, one sack, two tackles for a loss and one quarterback hit in a mere 22 defensive snaps. And the scary thing is Peppers may only be scratching the surface for what’s to come in the regular season as he becomes better acclimated to Green Bay’s 3-4 system. “With all that has transpired, I think most people had written Julius off like he had a good career and now it’s time to move on,” Packers outside linebacker Clay Matthews told FOXSports.com. “But for him and us to witness what he’s able to do each and every day, that’s clearly wrong. It’s evident by the way he practices and what he does in these games. Peppers thought he might never have the chance to showcase his athleticism in a 3-4 defense. The 6-foot-7, 287-pounder was a dominant pass-rushing end during his first eight NFL seasons in Carolina’s 4-3 system. But as his contract situation became more contentious with the Panthers in the late 2000s, Peppers was linked to the New England Patriots as a potential 3-4 outside linebacker through either trade or free agency. The speculation never came to fruition. Carolina held onto Peppers until his franchise tag expired after the 2009 season. When he did become a free agent, it was Chicago and not New England that came calling with an offer Peppers couldn’t refuse — a six-year, $91 million deal that included $42 million guaranteed. The trade-off: Peppers would shelve his 3-4 aspirations and remain at end playing in another 4-3 system. Peppers became even more intrigued through the years as he watched peers like Jason Taylor, John Abraham and Robert Mathis make the successful switch from 4-3 ends to 3-4 outside linebackers later in their careers. But before doing it himself, Peppers had to muster the courage to step outside of his comfort zone. That didn’t come easily, even for a player with a resume that includes eight Pro Bowl appearances and a spot on the NFL’s All-Decade team of the 2000s. Nobody should be happier about Peppers’ arrival than Matthews and defensive coordinator Dom Capers, whose units the past three years haven’t produced at the same high level as the one that helped the 2010 Packers win Super Bowl XLV. One of the main reasons was the lack of a pass-rushing bookend for Matthews, who has also struggled with injuries the past two seasons. Capers now has Peppers and a healthy Matthews to unleash on opposing quarterbacks, as well as rotational depth in backups Mike Neal and Nick Perry. “You think about some of the great defenses. They have always had that 1-2 punch with two guys that could rush,” said Peppers, who ranks third among all active NFL players in sacks with 118. “You need somebody on each side to kind of balance and give it that unpredictability. Peppers isn’t a finished product at outside linebacker just yet. He continues honing positional nuances like sometimes rushing from a standing position instead of a three-point stance or dropping into coverage more frequently than when playing end. One thing Peppers doesn’t have to worry about is acceptance from his Packers teammates. He quickly assimilated into Green Bay’s locker room fabric, which is something he didn’t think would come easy. Not only that, but the soft-spoken Peppers has emerged as an unexpected team leader. Packers inside linebacker A.J. Hawk said that stems from Peppers’ resume as well as his intensity on the field that belies his laid-back demeanor away from it. “I think when a guy is confident with himself and he’s real and he’s not trying to be someone he’s not, you gravitate toward that,” Hawk told FOXSports.com. “Julius never came in and tried to stand in front of the meeting room and tell everybody whatever. He kept his head down and worked hard. Peppers embraces his standing as one of the NFL’s senior defensive players and can even joke about some of what that brings. Peppers and the rest of the NFL now see him in a different jersey befitting his new position. The fact Peppers chose No. 56 after wearing No. 90 since entering the NFL in 2002 isn’t an accident. Nor was the switch made solely because Packers nose tackle B.J. Raji already has claimed the latter digits. “This is a fresh start so everything I wanted to start new,” Peppers said. “I wanted a new jersey so I looked at the list and saw the ones that were available. I saw (No.) 56. If you’re going to play outside linebacker and you’re going to try to mimic somebody, why not get 56 like Lawrence Taylor? He’s really the greatest defensive player ever or in the top three. The next step is to make Green Bay’s defense look better, too.